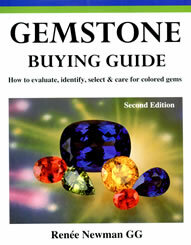 A great book to learn about the market for colored gemstones. Includes lots of basic information about colored gemstones: price factors, cutting styles, color, clarity, weight, synthetics, immitations and gemstone care. Our favorite parts are the many great photos and the detailed descriptions for a large number of gemstones. This book is a 7" x 9" paperback with 155 pages. Second edition. Do We Need Grades to Evaluate Clarity and Transparency?